San Mateo Developer Meetup on Cinco de Mayo (May 5th). The next Force.com Developer Meetup is in San Mateo next Thursday May 5th. (yes, Cinco de Mayo!). Get on your burro, and check out sessions on CA's Agile Vision, SSO and SAML, and Omniauth with Rails 3. Where does the day go sometimes? I was working away on some iPad apps, prepping sessions for Dreamforce, and before I knew it, it is 5pm already. It is never boring in the Dev Marketing team that's for sure! And speaking of never boring, the Force.com crew is hosting another Developer Meetup next Thursday, May 5th at the San Mateo campus. 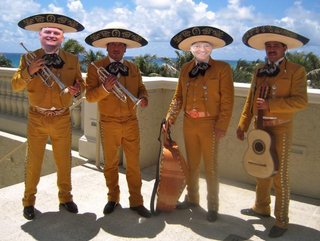 Yes, you read correctly—a Dev Meetup on Cinco de Mayo! I'm currently trying to get Kavindra and Katie to line up a Mariachi band, but we will see how we go. Thankfully, the session line at the meetup is going to rock even harder than the Metalachi band performing a cover of Sweet Child of Mine with CA talking about Agile Vision in track one, and Pat and I covering security topics like SSO with SAML and Omniauth for OAuth support in Rails 3 apps. If you haven't registered already, get that burro trotting over to the registration page, and sign up. The importance of bringing back simplicity.